Could this be the rear casing of the next iPad? We're kicking off the week with a new Apple-related product leak, this time with a photo purportedly showing the rear casing for the next full-sized iPad. 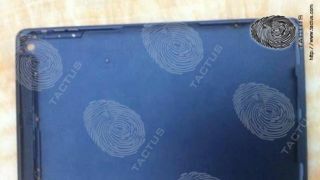 Tactus posted a leaked photo to its blog today, revealing what it describes as the rear shell for Apple's iPad 5 on the heels of an alleged cheap iPhone image published last week. The leaked image is also a follow-up to last week's reveal of rumored case molds for the tablet, which Apple is expected to announce in the coming months. According to Tactus, the iPad 5 will retain the popular 9.7-inch screen size introduced with the original iPad in 2010, but this year's model will slim down in an effort to get back to the fighting weight of the previous iPad 2. Apple took a fair amount of criticism for the third-generation "new" iPad released in early 2012, which sacrificed the svelte form factor from the previous model in favor of 4G LTE data capabilities and better battery life. Tactus claims the iPad 5 will shed extra ounces by powering its Retina-enabled screen with a Sharp IGZO panel, which is rumored to use up to 90 percent less power than the iPad 3 or iPad 4. The blog post boldly proclaims the iPad 5 will be a mere 7.2mm thick thanks to "a much slimmer LED backlight," which would be a noticeable reduction from the current-generation's 9.4mm thickness. Apple is said to again offer the iPad 5 in four storage capacities ranging from 16GB to the recently introduced 128GB, while Tactus claims the rear camera will receive a nice upgrade from 5MP to 8MP, as well.